I'm coming towards the end of my HK holiday which is always sad because it means I have to say goodbye to my family for another year. It also means I have to get back to the daily grind of work very soon too! ARGH. Today I have a post about my experience with LAKA Nail bar which I had last week. LAKA Nail Manicure Express is a nail bar located in LCX at Harbour City in Tsim Sha Tsui, Hong Kong. LAKA is an Israeli brand and the nail bars do quick mani and pedis. I discovered it when wandering around and was immediately drawn to the HUGE range of colours they had displayed! Again, please excuse the quality of the pics! I have only ever had one manicure experience at a salon a few years ago and it was not a good one at all. I had a french manicure done and it was total rubbish! The service was crap, the white polish bubbled and the whole mani chipped within 4 hours so I never bothered to get my nails done by anyone else after that awful 1st time. My purple gradient mani was starting to chip so I decided to try out the service hoping I would have a better experience this time. Plus I couldn't be bothered to go through the painful process of removing the glitter myself! Unfortunately I forgot to take a pic of what it looked like but here is a photo I googled of what the bar looks like. The one in HK has black decor but you get the picture! LAKA have a range of manicures and pedicures for different durations and prices on their menu to choose from. You can also choose extras such as nail art or treatments as well to add to your mani or pedi. There's no need to make an appointment either which is great. I chose the Manicure Express which included shaping, maximum growth coat, polishing and speed dry top coat which costs $108HK and takes about 15minutes. There was a special going on so I got it for only $88HK which was a plus! There were a few people already getting their nails done so the lovely sales girl offered to take my number down and phone me when they were available but I opted to just take a wander around Harbour City for a while and then head back. The sales girl was super friendly and lovely and spent quite a bit of time swatching the different colours for me so I could choose a colour for my mani. I couldn't make up my mind at all (just WAY too many nice colours!) but in the end I chose a bright pink however I can't remember the exact shade oops. The nail technician began by spending a good 15 extra minutes just removing my glitter polish which in itself made the mani worth it! My cuticles look worse for wear because the manicure express didn't include any cuticle care and loads of acetone was used to remove my previous mani. I stupidly left my Lush Lemony Flutter Butter at home too doh! She then shaped my nails using a regular nail file - however she filed them in both directions and also the sides too =S I was wincing A LOT at this point but left it as I don't know the proper etiquette for these things. I mean, it's a bit rude to tell her considering she does it for a living! After I got home I realised some of my fingers had been filed unevenly eg. my index and middle finger of my left hand which was disappointing but easily fixable. Besides that, the service was pleasant overall and WAY better than my 1st salon manicure experience! The nail tech was lovely (as was the sales girl) and very professional and explained what she was doing at each step. She applied the colour well and carefully too requiring very minimal cleanup. I dried my nails using the nail dryers and then she applied some quick dry drops. She really wanted to do some nail art on my nails as she said my nail beds were ideal for art (ie. BIG) but I was feeling el cheapo and didn't want to pay extra for it haha. I am very impressed with the polishes themselves! My mani lasted 7 whole days without chipping! From scanning the ingredients they are B4Free and are also SUPER pigmented - from swatching the polishes quickly they were mostly 1 coaters. The pink used in my manicure was only 1 coat! 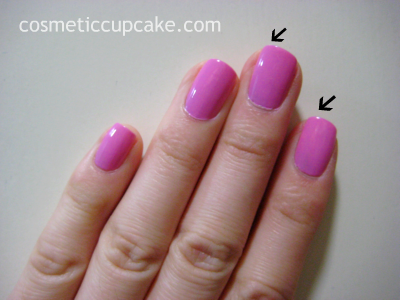 Plus there were no streaks that usually accompany pinks like this which can also be attributed to the nail techs skill. I purchased 3 polishes however I'm only showing you the 2 I'm keeping as the 3rd is for a friend and I will let her show you after I've sent it to her ;) I wanted to purchase a lot more so I had a hard time only choosing 3! I've wrapped up the polishes already in readiness for returning home so I can't tell you the names of the above polishes but they're numbers from memory. I chose the dark blue creme hoping it will be a dupe for Rescue Beauty Lounge Dead Calm which I really wanted in their 50% off sale and the dark grey creme appears to be a dupe for China Glaze Recycle - both hopefully one coaters. I also purchased LAKA Hand Peel which is an exfoliating hand scrub that doesn't require water. It made my hand feel really soft and supple! Thanks for looking! I'll be back in a few days with some Christmas manis after my arrival home. I like the colour you chose! Aww thats such a gorguz colour! I don't own anything like that so will deffo be hunting for a dupe :) And the manicure came out lovely, I honestly didn't notice the uneven filing! lol! :) I've found with getting a mani in a professional setting- some people know what they're doing and some just DO NOT. I love the color you picked! I remember there used to be an express nail salon where I live but it closed down after a few months into operation. It will also take 15 minutes to finish a manicure and a pedicure. Your post made me regret not trying out their service. @Eva M: Thanks Eva! That's fantastic that you've had good experiences with salon manicures. It definitely makes a difference working with professionals! @MissPukku: It was a lovely pink! I kinda regret not purchasing the polish as I thought it didn't really suit my skin tone. Oh well! @Aysh: That's what my sister and boyfriend said too - they said I was just being picky LOL. 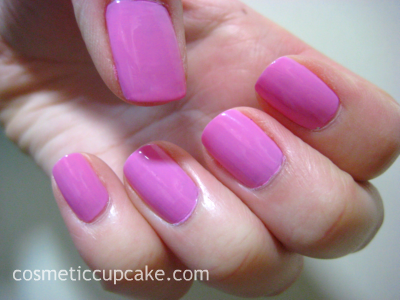 If you're looking for a dupe - Color Club "She's sooo glam" is KIND of like it but it's more pink. Good luck! @Rachel Marie: The place where I went to a few years ago definitely did NOT know what they were doing! @Rins: That is such a shame! I wanted to try out LAKA too for that reason too also and I'm glad I did. With beauty services it can be so hit and miss. @Donna: Sometimes you just want to be pampered instead of doing all the work =) definitely treat yourself! I hope you have a better 1st experience than I did! @Alice: About to email you! the pink is perfect, ugh, but don't know if the counter would still be there if I head to harbour city this week. @Cynthia: I hope the counter will still be there! But you never know in HK as things just open and close so fast.